Last Saturday night, I had a balletic epiphany. I wasn’t in a mirrored studio taking class or even in a theater watching a performance. This luminous ray of understanding beamed into—wait for it—the basement of a math museum. 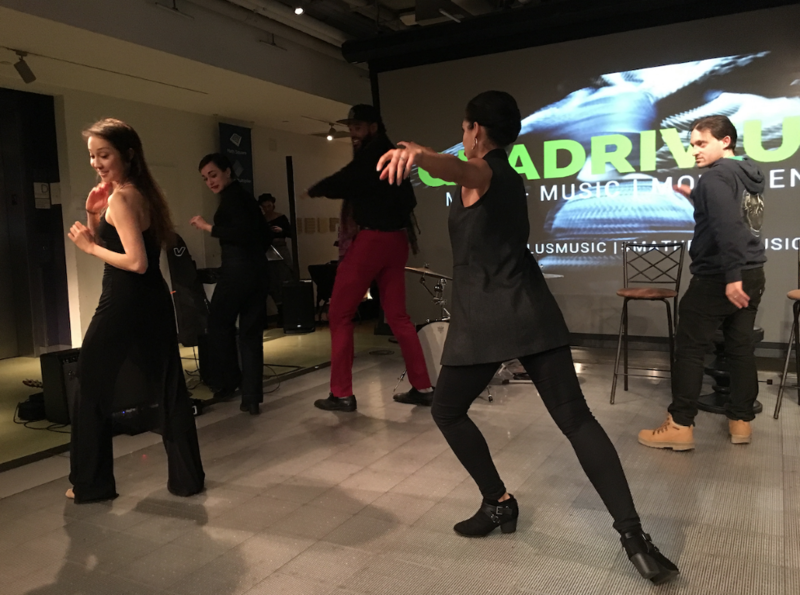 The National Museum of Mathematics (yes, that exists) hosted its fourth Quadrivium, a salon focusing on the intersections of music and math last Saturday in New York City. The evening’s special guests were none other than ballerina Merritt Moore and choreographer Claudia Schreier. After Schreier and Moore took their seats next to the event’s host, saxophonist Marcus Miller, it became clear how they all had ended up in a math museum on a cold winter’s night. Both Moore and Schreier attended Harvard with Miller. Moore was a physics major who went on to earn her PhD in quantum physics from Oxford University, all while performing with companies including Boston Ballet, English National Ballet and Norwegian National Ballet. “Excuse me, I mean Dr. Merritt Moore,” Miller corrected himself as he introduced her. Schreier studied sociology and dramatic arts and worked in marketing for Alvin Ailey American Dance Theater before breaking into ballet choreography. Her work has been commissioned by the ABT Studio Company, Vail Dance Festival, Joffrey Winning Works, and many more. Both Moore and Schreier offered a deep dive into the similarities they find between math, music and dance. And they note how their analytic and creative brains, rather than acting as opposing forces, work in harmony to make them better artists. Schreier explained, “I always start with the music.” She listens to a piece “ad nauseam” before steps and narratives begin to flow. Though her counts and the composer’s don’t always match, they’re rooted in the same meter. From there, her choreography blooms into a kaleidoscopic tableau rooted in pattern work. The lines the dancers create are geometric, though they tend to tilt daringly off-axis. Yet in these seemingly chaotic shapes, there’s bodily symmetry, Schreier says, whether it’s mirrored or rotational. 1. Newton’s third law will help your battements and jumps, and prevent injuries. “Newton’s Third Law: For every action, there’s an equal and opposite reaction,” Moore explains. Your teachers are basically repeating this when they give the correction “push down to go up” in grand battements and jumps. The force you use to brush into the ground or plié is the same amount of force that will propel the upward movement (minus some lost to gravity and air resistance). Essentially, your jumps and extensions will be much freer if you focus your energy in the preceding downward motion. Schreier and Moore agree that not fighting against these natural physical forces by over-muscling the legs is a smarter-not-harder approach that conserves energy and prevents injury. 2. Thinking of a pendulum’s kinetic and potential energy makes for better coordination and more emotive dancing. Demonstrating with an exquisitely pointed foot peeking out of her black jazz pants, Moore explains that there are two ways to move your leg up and down. You can either use your muscles in a measured way for each distinct motion, or, when the leg reaches its full extension, it pauses at the potential energy peak and then releases its kinetic energy as it falls. Moore prefers the latter; she says to embrace this pause at the peak and let it fall, instead of using your muscles to bring the leg down. Thinking of your swinging leg as a pendulum will help to feel more coordinated than if you think of each component as a separate movement. And if you fight the physical world’s natural forces, you’ll also lose the drama that balletic grace embodies. Moving the leg up and down in a flat motion without any peak or pause cuts short the soaring feeling the audience experiences with a suspended leg, turn or lift. Hearing familiar corrections worded in new ways can make all the difference. And sometimes, apparently, you have to break out the physics textbooks.